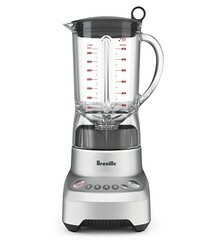 The Breville BBL560XL the Hemisphere® Smooth – How do you mix what floats with what doesn’t? The Hemisphere® Smooth, with the Hemisphere® Blade and Bowl system, with one touch, allows you to mix it all simply and elegantly. A. Inner Measuring Cup. B. Breville Assist™ Lid. C. 48 oz. BPA Free Tritan Jug. D. Hemisphere® blade and bowl system. E. Overload Protection. F. Smoothie Program. G. 4 Electronic Speeds. F Not Shown - Breville Assist™ Plug. A. ON/OFF Button. B. CANCEL Button. C. 4 Speed Electronic Settings ranging from MIX, with a slower folding action to blend delicate foods, to a high speed Liquify. D. Dual Function Button - PULSE/ICE CRUSH Button. E. Dual Function Button - SMOOTHIE/AUTO CLEAN Button.